Whether a resident or potential visitor to our community, in search of information on our vibrant business community or our beautiful parks and recreational facilities, we are confident our website will assist you in your researches. If you cannot find the answers you seek, or would simply prefer asking a question or talking to someone in person, contact the Unity Town Office at 1-306-228-2621 or click here to email your question. 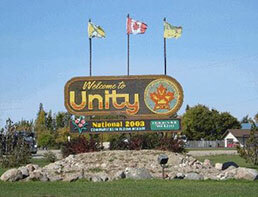 Do you have suggestions or comments on how to make the Town of Unity a better place to live or visit? Please click here to go to our comments and suggestions page.